When I first cracked open Blake Crouch’s new novel, Dark Matter, I was expecting something like a sci-fi It’s A Wonderful Life or The Family Man, the Nicolas Cage movie where a ruthless businessman gets a glimpse of his life if he had chosen a different path. Except this would be the reverse, since the protagonist here, Jason Dessen, has been living a comfortable suburban life with a wife and teenage son when, as characters repeatedly tell him in the opening chapters, he could have made a big world-changing scientific breakthrough in his late-20’s if not for all that. (Cold.) It’s a tried and true formula: after a requisite amount of “What’s going on here?” Our Hero takes a tour of his new surroundings, maybe for a minute he likes what he sees, but ultimately he learns it’s not for him, things worked out the way they did for a reason, and he finds his way back. It’s a predictable journey, but one with room for twists and turns. With a premise like that, there would be a lot of room there to explore what drives Jason, what caused him to make the decisions he did, what comprises the ‘self’ and what role compromise plays in all of our existences – choosing one path over the other. But what ensues isn’t quite that. 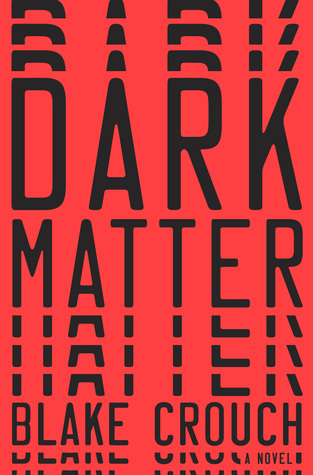 Instead, Dark Matter spends most of its 330-odd pages as a suspenseful thriller – one with enough excitement and thrills to keep the pages turning but that never quite rises to the occasion of its premise. While never far from the broad questions about the multiverse and the self, the book is mostly comprised of a series of pursuits, captures, narrow escapes, and harrowing visits to ghastly alternate realities (some aren’t that terrible, but they’re not right.) The multiverse-cracking technology is largely just a backdrop for these action-oriented scenes. The book never really puts its ideas under the microscope, so to speak. One could easily draw a close parallel to Andy Weir’s The Martian, for the way this book takes a hard-science, problem-solving, verisimilitude-heavy approach to a far-out scientific concept with a “survival-at-all-costs” bent. The story is mostly told in first-person-present-tense prose that goes a long way toward keeping the visceral, in-the-moment tension tight. But that style becomes a failing here and there, where Dessen finds himself recounting events that we’ve already read and absorbed, either for his own benefit or to explain to someone else. Whether that’s what would actually be said or not, it’s a drag to read. And there are a small number of chapters that break from this format to check in on characters who are not in the here-and-now with Dessen, but this isn’t done enough to make the breaks comfortable; it feels like Crouch is taking a shortcut outside of his narrative setup to give us some extra colour we couldn’t get if it sticks to the path. As the plot unfolds, there are a couple of intriguing set pieces afforded by the premise that revived my interest as I was getting weary of the “Run, escape, hide” rhythm. Crouch writes a good thriller, make no mistake, and the revelation that awaits Jason in the final act of the book was actually a jaw-dropping “Oh man how did I not see that coming? !” moment for me. Dessen’s final decision made for a nice swerve ending. I would have liked to see Jason rely on his scientific acumen more than on pluck and in-the-moment cleverness, the way Weir’s Mark Watney does, but that’s a minor complaint. I admire the way Crouch incorporates Dessen’s need to search his inner self into his path home, but like much of the book it could do with more examination instead of just being part of the puzzle. More importantly, the book and its thriller nature feels like a missed opportunity to me. You’ve got all these wonderful, potentially fascinating and enlightening toys on the table and you only want to play a basic game of cops and robbers. Perhaps it isn’t fair to judge a book by what it isn’t. I could quibble with what the jacket flap promised, but it said “thriller” and by goodness that’s what I got. But most reading experiences start by sparking the reader’s imagination as to what they are about to experience, and then playing with that expectation. It’s my misfortune some poor marketing copywriter sparked me the wrong way. The book could have been nearly double the length, sacrificed almost none of the action, and had something really tangible to say about life, the universe, and everything. Instead it drops its (rather underdeveloped, to be frank) protagonist into a pit of intrigue and watching him scramble his way out. I’m not saying the Family Man plot I thought I was getting is a guaranteed winner in this respect either, but at least in that one our hero gets a chance to sit down and catch his breath. As usual, my amazing guest blogger has made my little reviews look like first grader work. Hahaha, I’m so lucky to know such intelligent people. Don’t forget to follow him at scottowilliams.com and @scottowilliams.